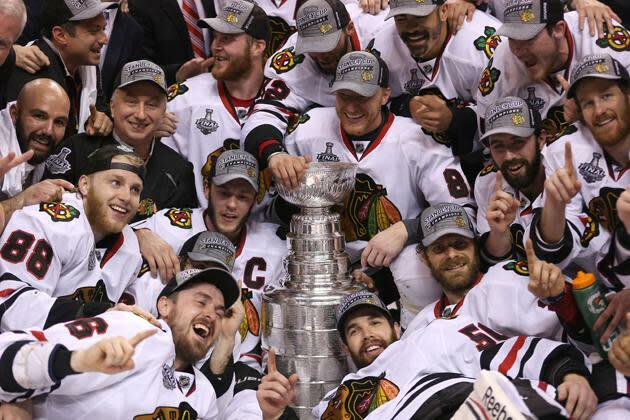 The Chicago Blackhawks are the 2013 Stanley Cup Champions. Through two periods, the Boston Bruins and the Chicago Blackhawks were even at 1-1. Neither team would budge. The final 20 minutes of Game 6 had the feel of overtime, and when Milan Lucic scored at 12:11 of the third period, it seemed like we were headed for a seventh and deciding game in Chicago on Wednesday night. But the Blackhawks had no interest in returning to Chicago for anything short of a parade. Six and a half minutes after Lucic put Boston ahead, at 18:44 of the third, Bryan Bickell tied the game. And then, just 17 seconds later, at 19:01, Dave Bolland collected a rebound off the left post and put it past Tuukka Rask. 59 seconds later, the Chicago Blackhawks had won it all. It was a tale of two opening periods, with the Bruins dominating the first and the Blackhawks taking the second. The opening 40 minutes also saw this Stanley Cup Final war of attrition continue to take a toll with Blackhawks forward Andrew Shaw taking a puck to the face, Niklas Hjalmarsson getting hit with a stick up high and Jaromir Jagr spending time in the dressing room with an undisclosed injury. But for one of these teams, all the pain of the last two months melted away when Jonathan Toews, who scored the Blackhawks' first goal in this game, tying it at one, triumphantly lifted the Cup overhead. After the captain, the next four Blackhawks to hoist the Stanley Cup were all players lifting it for the first time. And speaking of first-timers, Patrick Kane won the Conn Smythe for playoff MVP, his first, and America's third in a row.